There’s more than a little irony in a university under the patronage of Our Lady, Notre Dame, inviting our pro-abortionist President to be the key note speaker at its Commencement ceremony. The Virgin, you see, and abortion, are in opposition to one another, with the one standing for life and the other for death. Even so, the great Indiana center of catholic academia invited Barack Obama onto its rostrum where he was received with rapturous applause. There you have it, tolerance and tradition within the Roe v. Wade envelope; compelling stuff, and given its warm reception, welcome words to ears that have doubtless grown tired of the emotionally charged debate at either end of the pro-life, pro-choice spectrum. In contrast to the shrill tendency to "demonize” one another the President plots a seemingly reasonable middle course; instead of conflict we’re to have dialogue until, presumably, everyone ends up in some kind of latter day Anglican utopia, where "seekers" wend their way through labyrinths of conversation to the soft reverberation of drum circles and dimly heard feminist workshops. Whatever, there’s no question that the kids loved it, to say nothing of their professors, but is the vision as reasonable as it appears? Maybe it is, with Mr. Obama advocating an apparently centrist position in the ongoing malthusian narrative. Abortions are a tragedy, he thinks, and as we “dialogue” the subject, we should do our best to discourage them in order to reduce their frequency, all the while upholding a woman’s right to have the procedure in question. Everything here seems eminently fair and sensible, a via media has at last been reached and seeing this, the “best minds of our generation” stood to applaud their leader’s new found golden mean. All well and good, but only as long as we forget the terms of the debate or more to the point, the persons it affects. What’s at stake here is life itself, the lives of millions upon millions of unborn or partially born infants, who are being killed in abortion clinics. This is what the story is about, which allows us to rephrase the argument - it's not so much a political as a moral one where there can be no middle ground between good and evil. Imagine a situation, such as existed in classical antiquity, or modern China, where unwanted babies were exposed to the elements to die. Now, apply the President’s words; we are to approach this with open minds, fair words and open hearts. We are to adopt a non-confrontational stance in this, to come at it from a position of balanced conversation and mutual respect, but with the best will in the world, how? 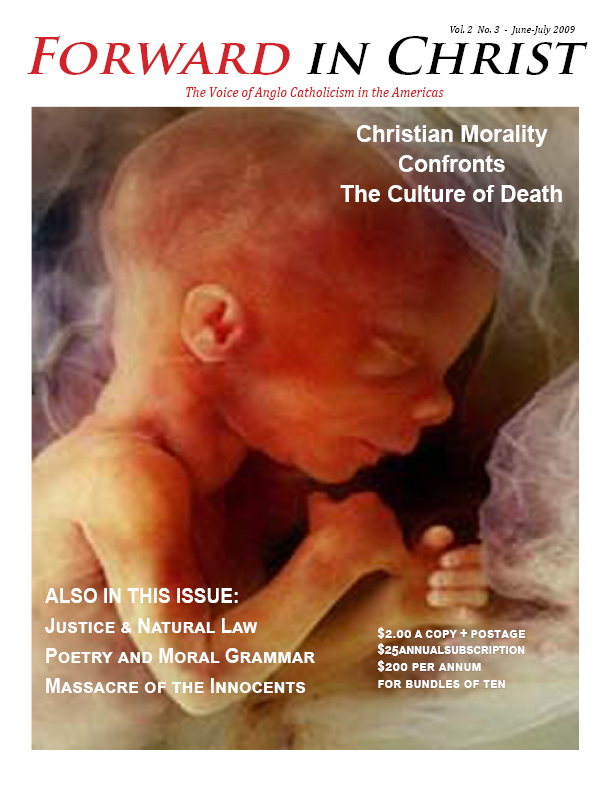 In what way can the Christian engage with infanticide “fairly”? What reading does the open catholic heart give to such a text? And the mind, alive to the sheer enormity of the proposition before it, that it is permissible to kill children in the womb, what response can it reasonably give? The answer, surely, for the catholic Christian, and the two are synonymous, is to condemn the practice utterly. There can be no middle ground in such a business and the Church recognizes the fact. Notre Dame perhaps withstanding, this has been the teaching of the Body of Christ and the understanding of the faithful since the days of the Apostles. Why? Because the Church is about life, it is the indelible hallmark of the Faith given to us by Christ, and as a result stands in resolute opposition to those who would denigrate or destroy it – not least in the form of unborn children. To return to the Notre Dame speech; before making his plea for dialogue the President admitted “no matter how much we want to fudge it… the fact is that at some level, the views of the two camps are irreconcilable.” So they are; one side promotes a culture of death and the other a culture of life, the President is right, the issue cannot be "fudged." Nor can it, either we believe that human life is sacred from conception or we don’t, and if not, let’s not pretend that our view is somehow Christian. To put it bluntly, the time for compromise is over as the Faith and its opposite are thrown into increasingly sharp relief. Perhaps nowhere is this so clear as on the issue of abortion. Is there any other place or locus of thought and action, where the difference between minds informed by the teaching of Christ and those that are not is so marked and distinct? I doubt there is and the issue is emblematic. For too long we have been making ethical, or moral withdrawals from the Christian bank account without refund, and the result is predictable. Our marriages and families fall apart because we no longer believe in the divinely instituted Sacrament of Matrimony. Virtually every sort of sexual license is accepted and no wonder, what reason does a person who has no faith in Biblically covenanted sexuality have to stay within its bounds? For that matter, why not terminate the unborn if you have no conception of life sanctified by the Incarnation? What's happened, in the West at least, is that we’ve removed one God from our lives only to replace Him with another. We must not fool ourselves that this deity is anything other than dark, violent, and destructive. It is the false god of self-will, whose commandment “do what thou will shall be the whole of the law” is fast disintegrating the common life of what was once Western Christendom. There can be no dialogue, no openness of heart and mind with such a deity, for as our President implies, his ways are irreconcilable with ours.